I wrote this story with Gilbert Bailon. It was published on Oct. 25, 1998. In a rare, wide-ranging interview lasting more than six hours, Mr. Castro criticized the longtime U.S. ban on trade with Cuba, vowed to stay in power as long as the Cuban people wanted him and taunted his foes in the Cuban exile community. “They must think that God is bad because God has not eliminated me from the earth,” said Mr. Castro, 72. Saturday’s encounter, which included two editors from The Dallas Morning News , marked the first time members from the editors’ group have met with Mr. Castro in Cuba. The group’s last meeting with the Cuban leader took place in the United States on April 17, 1959. Wearing his traditional olive-green fatigues, Mr. Castro spoke in Spanish, which was simultaneously translated into English for the editors. Anti-Castro activists – including Cuban exiles and some Republican lawmakers – had criticized the group’s four-day visit. They said it was hypocritical for the editors’ group to fight for freedom of the press at home, then meet with the Cuban leader whom they accuse of squelching press rights on the island. The group defended the trip, saying the main goal was to help editors learn about Cuba and its place in the world. During the meeting, association members pressed Mr. Castro to explain why his government has allowed only one American news organization – CNN – to operate in Cuba. He responded that he has not completely opened up Cuba to the American media because too many news organizations distort reality in Cuba, which he said undermined his 1959 revolution. He cited what he described as an inaccurate report in Forbes magazine that contended Mr. Castro has amassed a billion-dollar personalfortune. The delegation – which also included editors from The Boston Globe, Detroit Free Press, San Francisco Examiner, Colorado Springs Gazette, Fort Lauderdale Sun-Sentinel, Miami Herald and other organizations – fired tough questions at Mr. Castro. Mr. Castro sounded many familiar themes, calling the U.S. trade ban “criminal,” defending Cuba’s brand of socialism and portraying his country as a defiant little island that has dared to stand up to the most powerful nation in history. * Cuban law does not allow authorities to jail people for merely “disrespecting” the government, according to the Cuban leader. But those who actively plot against the government and carry out what he called “counterrevolutionary” activities, can be punished under the law. * Most people fleeing Cuba, Mr. Castro said, are not political refugees. Like Mexico, the Dominican Republic and other developing countries, Cuba has produced thousands of “economic refugees,” Mr. Castro said. He estimated that only 15 percent of those leaving Cuba could be considered political exiles. And very few of those who have left would return to the island if there is a change in government, he said. * Although wages in Cuba average the equivalent of about $10 a month, Mr. Castro said they are not as low as they might seem. That is because basic needs such as housing, health care and education are largely satisfied. “There are many subsidies,” he said. Asked how long he planned to stay in power, Mr. Castro said he would be president as long as the Cuban people want him in office – and as long as he is physically and mentally fit. 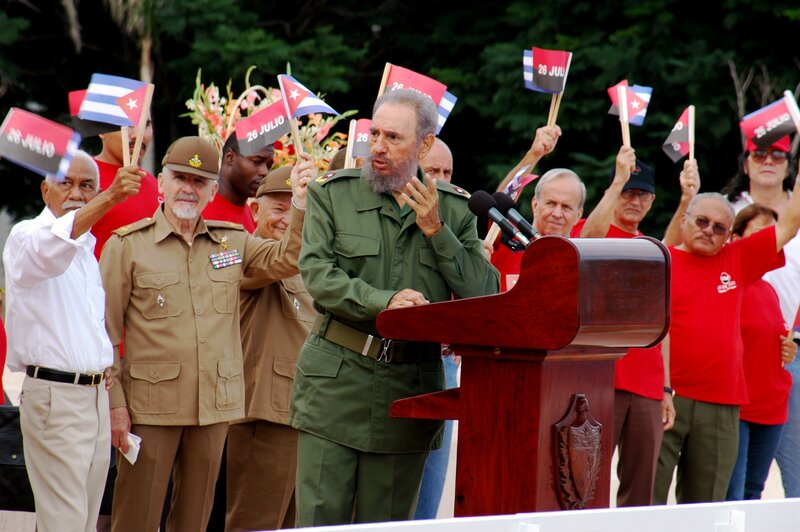 But Mr. Castro also expressed confidence that what he termed the revolution would continue with or without him. He said Cuba has many capable leaders, including Raul Castro, head of the armed forces; Ricardo Alarcon, president of the country’s national assembly; and Carlos Lage, the vice president. The Cuban leader discussed his nation’s economy, which nosedived in the early ’90s after the end of nearly $6 billion a year in subsidies from the former Soviet Union. To keep the country afloat, officials are increasingly relying on tourism and the Cuban people are now allowed to possess U.S. dollars – something that was previously illegal. The emerging mixed economic system has created new inequities as the gap grows between those who earn dollars and those who don’t. But Mr. Castro said he had no choice but to turn to tourism. “We need the hard currency,” he said. New four- and five-star hotels are springing up in Havana even as some of the city’s old colonial buildings languish. But Mr. Castro said his government is simply spending money on the projects most likely to produce new sources of income. And that new income will go toward housing projects, medical care and education for all Cubans, he said. The Soviet Union also supplied Cuba with most of its oil reserves, and its demise meant that Cuba had to look elsewhere. As money grew increasingly tight, the government was forced to neglect some of its projects, such as cleaning up and painting many of Havana’s faded colonial homes. “If we were to discover an ocean of oil, then we would paint those houses,” Mr. Castro said. Among those resources, he said, are baseball players who are better than the World Series champion New York Yankees. One of those Yankees is pitcher Orlando Hernandez, who escaped Cuba is a raft last year so he could play in the United States. Mr. Castro lamented his country’s tough economic times, but said Cuba has done a lot with scarce resources. The country has 63,000 doctors, he said, more per capita than anywhere in the world. Life expectancy is 76 years, well above that of most developing countries. And education is free and universal. “I doubt there is any other place where each cent is used more rationally than in Cuba,” Mr. Castro said. And if anyone doubts his selfless nature, he said, consider the fact that he has been given 17,500 gifts over the years. Mr. Castro said he had donated all of them to museums and other attractions in Cuba. The editors’ visit brought that number to 17,501. Edward Seaton, president of the association, gave Mr. Castro a baseball signed by Chicago Cubs slugger Sammy Sosa. “Thank you,” Mr. Castro said.